I get asked to review cookbooks from various chefs all the time, but there are two chefs in particular I've been waiting on; Mario Batali and Lidia Bastianich. It's no secret that I love everything these two make and to review one of their books is a dream of mine. Well about a month ago this dream came true; I was sent a copy of Lidia's Favorite Recipes to review. Let me just tell you I was super excited when the book showed up in my mailbox. I started flipping through it almost immediately. I say almost because first I had to call everyone and share the good news....I'm reviewing Lidia! 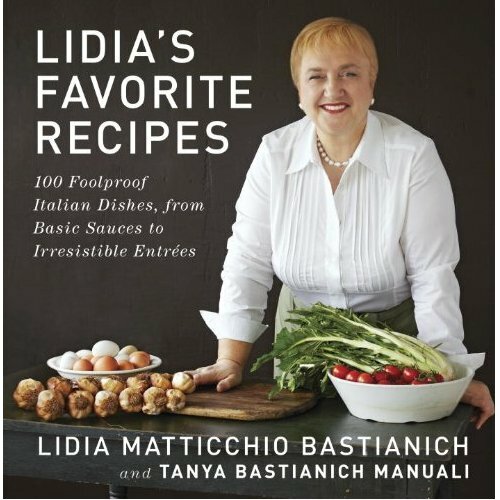 As the title states Lidia's new cookbook is a collection of her favorite recipes. Having all of her previous cookbooks, and cooking from them for years now, I was somewhat concerned that I would've already made everything in this book. I quickly found there was no need to worry. There are over 100 recipes; including some old standbys like: Butter Sage Pasta Sauce and Braised Pork Ribs with Rigatoni, (two things I make a lot). And a bunch of new recipes I haven't tried; like the Octopus and Potato Salad. Lidia encourages her readers to cook for friends and family; and includes many crowd pleasing recipes in a very straightforward format. Sections in the book include the standards like: Salads, Pastas, Meats, and Desserts and some extras like Sauces, Sandwiches and Pizza. Having the book for a little over a month now I've already made 5 new recipes my favorite being the Baked Polenta Layered with Mushroom Ragu. 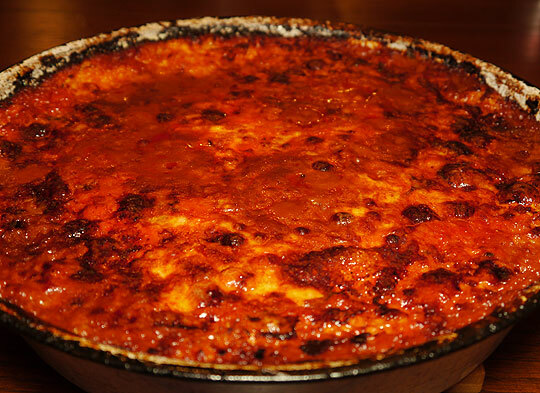 It's a lasagna of sorts made with polenta instead of pasta, that can easily be prepared in advance and served family style. The complexity of flavors, from the mushrooms and cheese, makes it something your guests will absolutely love. ****Now here's the fun part. I am giving away a copy of Lidia's new cookbook to one lucky reader. All you have to do is leave a comment on this post. Want some additional entries? Follow me on Facebook or Twitter and leave a separate comment for each. In a medium cast-iron saucepan or other heavy pot, bring all ingredients except cornmeal to simmer over medium heat. Gradually sift remaining meal into the pan, continue to stir, and reduce heat to medium low. Continue to stir until the polenta is smooth and thick and pulls away from the sides of the pan as it is stirred, about 30 minutes. Discard bay leaf, pour polenta into a serving bowl or onto a wooden board, and allow it to rest 10 minutes. To serve from the bowl, dip a large spoon into hot water and scoop the polenta onto individual dishes, dipping the spoon into the water between scoops. To serve from the board, cut polenta into segments with a thin, taut string or knife and transfer to plates with a spatula or cake server. Squeeze out the soaked porcini and slice them into pieces about 1/4-inch wide. Strain the soaking water and keep it in a warm spot. Clean, trim and slice the fresh mushrooms into moderately thin slices, barely 1/4-inch wide. Tie all the fresh herb sprigs together with piece of kitchen twine or enclose the leaves in cheesecloth. Put the oil and butter in the big skillet (or other saucepan) and place over medium heat. When the butter melts, dump in the onions and shallots and 1/4 teaspoon of salt and stir well. Heat the onions to a slow sizzle and cook for 6 minutes or more-stirring often-until they're soft, wilted and shiny, without any browning. Pour all the mushrooms into the pan-both the chopped porcini and sliced mushrooms-spread and toss them in the pan. Sprinkle another 1/4 teaspoon salt, drop in the herb bouquet, toss briefly, raise the heat a bit and cover the pan. Cook covered for about 3 minutes-shake the pan now and then- to sweat the mushrooms. Uncover and continue to cook over fairly high heat, stirring frequently, as the mushrooms shrink and the liquid evaporates, 5 minutes or more. When the pan is dry and the mushrooms begin to brown, clear a hot spot, drop in the tomato paste and toast it, stirring, for a minute or so, then stir it into the mushrooms. When everything is sizzling and browning again, and just starting to stick, pour the Marsala all over. Stir constantly as the wine thickens and evaporates. When the mushrooms again start sticking to the bottom, pour in the warm mushroom water and 2 cups of the hot stock. Bring to an active boil, stirring up any caramelization on the pan bottom. Lower the heat to keep the sauce bubbling gently all over the surface and cover the pan. Cook for about 20 minutes, occasionally stirring and adding stock to keep the mushrooms nearly covered in liquid; expect to add 1/2 cup or so. Adjust the heat to keep the perking steady but not too rapid. Uncover the pan and cook for another 20 minutes, maintaining the simmer and adding stock as needed. When mushrooms are thoroughly tender and the saucy liquid thickened-but not too condensed-the sauce is done. Remove the herb bouquet and discard it (after you scrape off all the good sauce). Taste and add salt, if needed, and freshly ground black pepper to taste. Use the sauce immediately or let it cool. Store it in the refrigerator for a week or freeze, for use within several months. Preheat oven to 400 degrees and set rack in the center. Butter a 9x13" baking pan or 12" cast iron skillet. Use more butter on bottom if you want to unmold the dish to serve. Pour in half the polenta and spread it evenly in the bottom of the pan. scatter 1/3 cup of the shredded cheese over the top and sprinkle with 4 tablespoons of the Parmigiano. 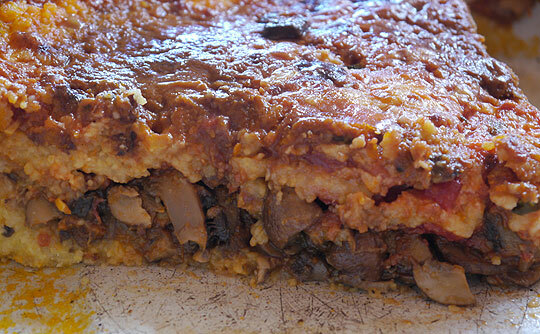 Pour 2 cups of the Mushroom Ragu over the polenta and cheese and spread evenly. Pour on more than half or the remaining polenta and spread. Top with some of the cheese and sauce. For the top layer, spread the rest of the polenta, more sauce and cheese. Set the pan on a cookie sheet and bake for 45 mins to an hour or more. Until the top is deeply colored and crusted. Let cook for a few minutes before serving. I too am a big fan of Lidia's. This recipe sounds great and I plan on giving it a try. OMGosh can I win two things in a couple months haha!!! I love Lidia!!! I admire her cooking style and recipes are simple and authentic! yum! I'd looooove to win this book...good luck to all! I have four of Lidia's cookbooks; they're a staple in our house. Love the TV show, and just bought some polenta from her through OpenSky. My family's from Emilia Romagna, and I love seeing recipes from that area, especially near Piacenza. I do not have a single Lidia cookbook! How can that be?!!! I would love to win this! The receipes you posted look delicious! I would love to win to try more of them. Thanks. I would love to win a copy of Lidia's Favorite Recipes cookbook. I love lasagna. This recipe for the mushroom ragu looks so good. It has never occurred to me to use polenta in a layered dish. I definitely want to give it a try. I love Lidia. Getting to eat in her restaurant in Pittsburgh is always a treat! oooooooooooh it's Lidia! I was in the bookstore on a lunch break last month and I picked up her book to skim though. Within 5 minutes, my stomach growled! I had to begrudgingly remind myself that I was there to purchase a Christmas present...not a "it's for me!" present. I am so thankful that you posted this recipe for Mushroom Ragu - oh what a beautiful aroma it will have in my kitchen! Perfect for the winter time! Would love to win this - love Lidia!! Recipe looks wonderful! Thanks for sharing! I love watching Lydia on our local cable channel on PBS! I love Lidia's cooking! Would LOVE to win this! !